⛩ A gateway to the scared. Hi friends! 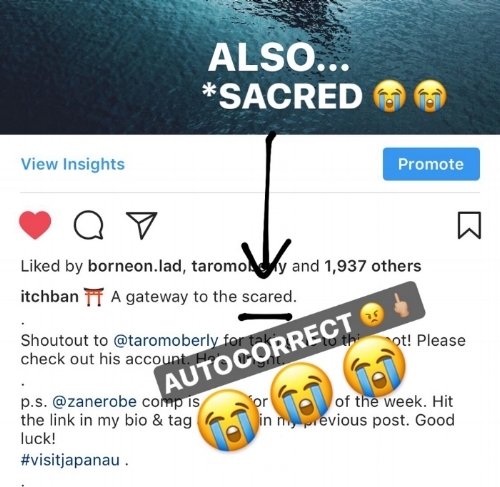 I posted a photo on Instagram the other day with a pretty sucky autocorrect mistake (see above). It was meant to be "A gateway to the sacred" (not scared) - a pretty big difference in meaning. By the time I noticed this autocorrect mistake, it was 1.5 hours later and my photo had already gained 1,937 likes and a bunch of comments. I posted about this error on my story, and got a ton of DM's from you all informing me that I can edit the mistake in the post (thanks for looking out fam). When you post a photo on Instagram it starts accruing engagement (likes, comments, saves & shares). The Instagram algorithm uses this engagement as a kind of ranking to determine the quality of your content. If you get a lot of engagement (especially within the first hour), the algorithm will favour your post and promote it. Your post will be distributed higher up in people's feeds, show up on more users explore pages, and if you're lucky, hit top posts for location & some/all hashtags used. That's how posts end up doing well, and kind of how Instagram works these days. Every time you edit your Instagram post (after you've posted it), Instagram resets your engagement ranking. All the likes & comments you've received up to that point will reset and not count anymore. If you've hit top posts for any location or hashtag, you'll be taken off top posts. You're basically telling Instagram to ignore all the likes & comments you've received so far. This can absolutely crush a photo's performance, regardless of how lit-fam it is. *I've tested this multiple times myself; others can also confirm. Every time I save changes to my post, I get taken off top posts immediately, and it is almost impossible to make it back on top posts (because I've lost the bulk of my engagement momentum). Likes and comments tend to slow down to a trickle after that too. Of course, you can try it yourself. When you have a post that makes top posts for a hashtag, edit your photo and see if it gets taken off top posts or not. Please let me know your experiences with it. I think it's ok to edit the photo & caption at the very early stages of posting - anything under 5 minutes. Once it starts to gain (engagement) momentum, don't edit it! Just leave the error and fix it after the likes & comments have stopped rolling in. This may be a measure by Instagram to stop people from switching out hashtags, tags and mentions in an effort to mess with the algorithm - who knows. Either way, my best advice is to avoid editing photos once you've posted it. Let me know if this has helped you in the comments below. Feel free to drop any questions there too.